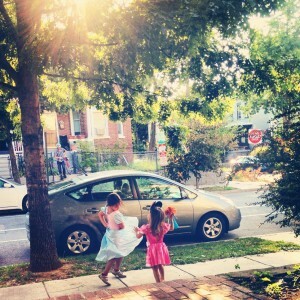 I spend a lot of time writing about the wonderful reasons we live on Capitol Hill in DC: kid-friendly coffee shops, free museums, and nearby beach getaways. Sometimes, it’s hard to imagine who wouldn’t want to live here. Today, I was reminded. My next door neighbor sent a group email letting our street know that he had been assaulted and robbed at 8:30 last night. It happened on our street. He was walking home from the metro, as we’ve all done a hundred times before, and was followed by a group of kids (thuggish teens). When he turned onto our street, he was punched in the head. When he fell to the ground, they took his bag and ran off. Another neighbor saw the aftermath, screamed, and then called 911. Since he was hit from behind, my neighbor didn’t get a good look at who did it, so nobody was arrested. Neighbors on the Hill are always really close. Maybe it’s the fact that we practically live on top of each other? I remember living in North Carolina, driving into my garage after work every day, and not even knowing my next door neighbor’s name. Here, we’re like family… for better or for worse. As we all started to arrive home from work tonight, we gathered on our front stoop for a hug-fest/therapy session/why-the-hell-do-we-live-here pow-wow. One neighbor pulled up with a bouquet. Another offered a replacement cell phone for the one that was stolen. One offered to drive him to and from the metro so he wouldn’t have to walk. Another gave suggestions about how to find the bad guys, and make sure they’re arrested. All the while, my daughters played in our tiny (joke of a) front yard with a friend, and Dave picked up used dime-bags and 40-bottles to throw in recycling. A cop rode by on a bike and stopped to ask how our neighbor was feeling after the assault. The Hill is a strange place to live. We take the good with the bad. But it seems like every time we get comfortable, something else happens. A friend’s home is robbed 3 blocks away; someone is shot down the street; we witness a drug deal on our front steps. As I’ve said before, Capitol Hill is definitely the crossroad between heaven and that other place. And every day we face the question: should I stay or should I go?